After two days at sea, we arrived in Key West from Tarpon Springs earlier than expected, around 4am. We anchored outside the Northwest Channel to await daylight because all the guides tell you to avoid the Key West approaches at night unless you are very familiar with the area. We are so glad we waited. In the light of day we were able to see hundreds of crab traps that could have gotten caught in our propeller and a huge rock breakwater lining the channel that was hard to see, even during the day, and not well charted. Since we have been to Key West by land a couple times before, we decided to explore the water side of the island. We found it very disappointing. Most anchorages were crowded, dirty, and full of derelict boats. On the first night, a storm blew through the area with winds gusting up to 50 knots. Boats all around us dragged anchor and, in the morning, we could see several boats tossed up on the shore. In addition to the crowded conditions, mobs of tourists on jet skis dart in and out of the anchorages at full speed all day long. Parasailing boats think it’s funny to see how close they can get their customers to a sailboat mast despite the dangers to all involved. Power boaters don’t think twice about zooming ten feet away from an anchored boat at full speed. After a day, we were ready to leave. The highlight of the Key West visit was our first diving excursion from our own boat. We sailed a couple of hours away to Sand Key, picked up a mooring, and dove a beautiful coral reef with shallow canyons. This was the first time using the SCUBA air compressor we installed before we left New Orleans. It was amazing to return from a dive to our house and have all the amenities of home waiting for us as soon as we got out of the water. For the first time since we started diving fifteen years ago, we were completely by ourselves; exploring the water on our schedule. 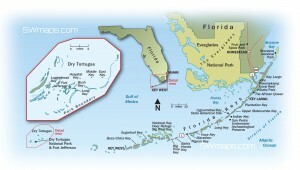 We returned to Key West for the night (to a mooring this time, where the boats around us seemed more secure) and we set sail in the morning for the Dry Tortugas, about 55 nautical miles to the west. birds and turtles. 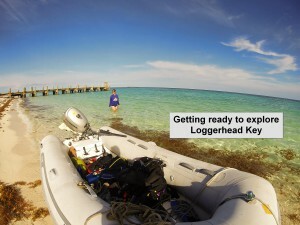 But the two open islands, Loggerhead Key and Garden Key, have a lot to offer. 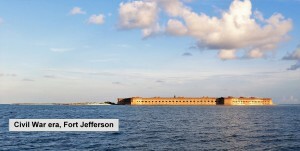 We spent the first day exploring Fort Jefferson and then took the dinghy for the four mile ride to Loggerhead Key to dive the wreck of a century old windjammer ship. The wreck was covered with coral and teeming with marine life. Our visit was not all play. 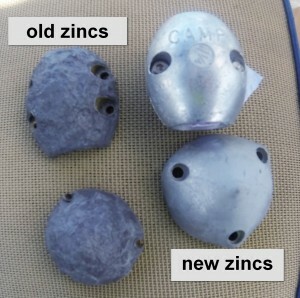 We took advantage of the crystal clear water and spent a day cleaning the hull, through-hull water inlets, and replacing all the sacrificial zincs (metal pieces that attach to the propeller, shaft, and bow thrusters and are designed to decay with electrical currents in the water so the important parts don’t deteriorate). As we were finishing our projects, the people on the catamaran anchored next to us invited us over for drinks. It was our first such invitation, and we had a wonderful time getting to know John and his friend Josh, and touring John’s spacious boat. On the way back East, we stopped to provision in Key West. The previous time we provisioned, we were dockside in Apalachicola and everything was walking distance. 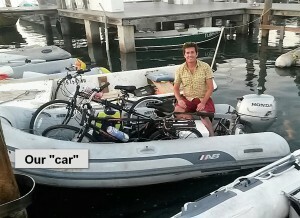 For the first time, we took the bikes in the dinghy to town in Key West to get all our shopping done. We looked pretty funny riding around town with a 10lb cylinder of propane strapped to the back of a bike. 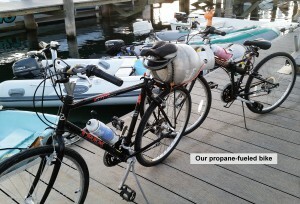 We got several jokes about our gas powered bike along the way. After running around town in the heat all afternoon and all our shopping complete, we stopped for a well-earned happy hour cocktail before overloading our dinghy and heading back to the boat. Here comes Hurricane Erika…headed right for the Keys. Fortunately, the storm weakened, but it still posed a risk to Key West. The last place we wanted to ride out a tropical storm at anchor was Key West because of all the derelict boats with questionable anchors and rotted rode (that’s sailor talk for the rope or chain that ties the anchor to the boat). 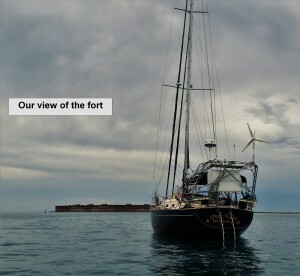 We found a well-protected anchorage on the charts about 20 miles east of Key West, and headed out. 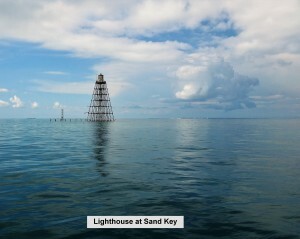 Big Pine Key has a large, shallow bay that protected us from winds and waves from almost every direction. Best of all, there were only five other boats anchored in the entire bay. After anchoring, we checked the weather and opted to stay there until the remnants of the tropical storm passed. Although we had steady winds with gusts over 30 knots for the whole day of the storm, the protected bay gave us some of the calmest conditions we had seen so far and we got some much needed rest. The day after the storm moved through was a beautiful, clear day with great winds to sail to our next destination, Marathon Key. Marathon Key was supposed to be a quick stop for a day or two to visit a friend and provision, but our engine continued to overheat despite our earlier troubleshooting and repairing of what we could ourselves. Since there is a diesel repair sho p in Marathon specializing in our type of motor where we could dock the boat for the repairs, we decided to do it now rather than later. It turns out we had more serious issues than just an overheating engine, our turbocharger was leaking oil. 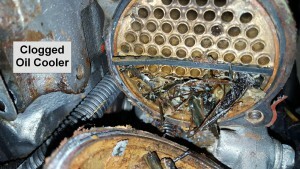 This is a dangerous situation than can cause a runaway engine and lead to complete catastrophic failure when least expected. So glad we had it looked at by experts! We’re now ready to continue the journey with a clean oil cooler and new heat exchanger and turbo charger. These repairs put a dent in our budget, but it would have been much worse if it happened later in our trip in the Bahamas or beyond where getting parts is expensive and time consuming. Next stop, Key Largo in the Upper Keys. 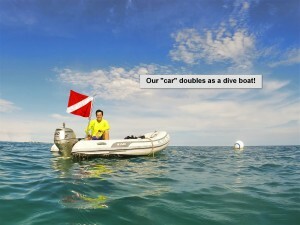 We will get our Divemaster certifications and then onward to the Bahamas. Wow I loved reading about your travels already so happy for you both. I will probably say this often over the years Safe travels and smooth sailing! Great update! Thanks for sharing your stories! Saw a link to your website on FB. On the Steel Wreck…as the locals used to call the windjammer, does the old Volkswagen sized Goliath Grouper still live there? I was there about twenty years ago, and it sure was a big scary fish. Anchorages down there are often criminal. Make sure your boat is well secured, nothing left on deck. Those derelicts on occasion are routinely cleaned out by storms. Kind of a normal,thing down there. Happy sailing to you. 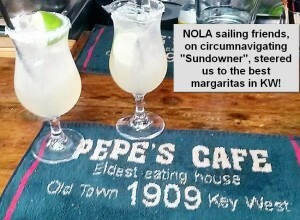 If you happen to get to Miami..Dinner Key anchorage or dockage is very nice. People are getting routed out of the Marine Stadium anchorage, as there is nowhere safe to leave the dinghy anymore, and access to,shore is limited due to the stadium reconstruction. BTW….. My favorite restaurant in Key West is BO’s Fishwagon. With the old pickup truck and thatch roof…all local seafood there. I’ve been in and out of various places in the keys, day and night, and believe me, a big spotlight is most helpful at night. I used to own one from an old LaFrance fire truck. SOB was bright! 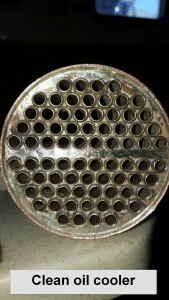 Big reflector, better than the modern junk. Also, this time of year, the Hawk channel,is full of them too. Enjoy your diving time there, I liked Looe Key the most. What kind of dive compressor are you using. I’m thinking about one for my boat…someday. Thanks for the great info. We’ll try BO’s Fishwagon when we return to KW this winter. We did not see the giant grouper at the Steel Wreck, but we only dove it once. We are using a Brownies YP-25 because it’s the only electric compressor we could power with our existing 4kw genset. If you have a larger genset, or don’t mind a diesel or gas compressor, I would go with the Bauer Jr. II because it’s a lot less expensive and gets great reviews. Thanks for the warm welcome! Our time here has been busy but wonderful. We will keep an eye out for you. Thank you for the update. It sounds like you’ve had an adventurous month. I’ve never been to Key West but I hear it’s beautiful. So glad you were able to get the boat repairs you needed…it always worried me when traveling to have mechanical issues. 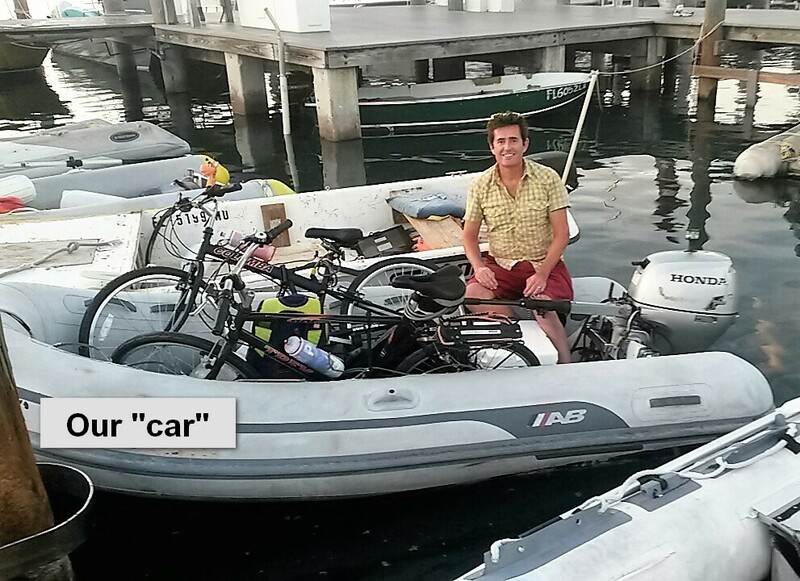 I’m amazed that you can fit the bikes and a dingy in your home!! What is the propane used for by the way? Glad to hear you were safe during Hurricane Erika! I’m so happy you have this blog so we can follow you! Love you both ?